Huge congratulations to Arnie Adler, our fav NY corporate and editorial photographer, for his pics today in the Wall Street Journal story Poets House Holds Annual Brooklyn Bridge Walk, Honors Naomi Shihab Nye / Night Included Chicken Dinner in Dumbo Neighborhood. 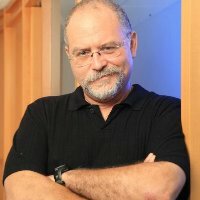 Arnie has been around for a while, he does great work, and he’s a consistent and appropriate marketer. Arnie sends one of the few email updates we like to get because we see the great work he consistently produces. Some 300 readers joined Ms. Nye and the organization for its 19th annual Brooklyn Bridge walk, stopping midway for more readings from Ms. Nye, Thomas Lux and Vijay Seshadri, this year’s Pulitzer Prize winner for poetry. The crowd was silent during his 20-minute reading. “It inscribes the theory and implication of the bridge into the consciousness of the city and the psyche of the city,” Mr. Doty said. This all got me to thinking about Brooklyn, the bridge, and poets, and my immediate embrace of the relatively new organization Brooklyn Poets. There’s a deep, rich literary tradition in Brooklyn that is enduring and diverse. Perhaps we can all agree that the great-grandfather of this tradition is Walt Whitman, and some argue that American poetry was born with Whitman in Brooklyn in 1855. Walt was out to celebrate himself more than 100 years before the first hippie emerged. 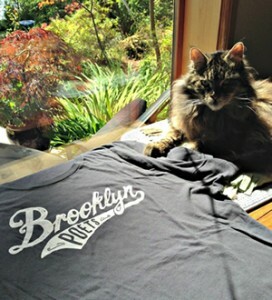 To assure my bona fides in this issue pictured right is my official Brooklyn Poets swag (expensive but high quality and really beautiful) in the sunshine with Elizabeth, our cat who is celebrating herself, the sunshine, and T.S. Eliot. We’re a long way from Brooklyn but thanks to Arnie for capturing the bridge and the poets and the event so beautifully.